Last week I sewed up a pair of Megan Nielsen Harper Shorts. 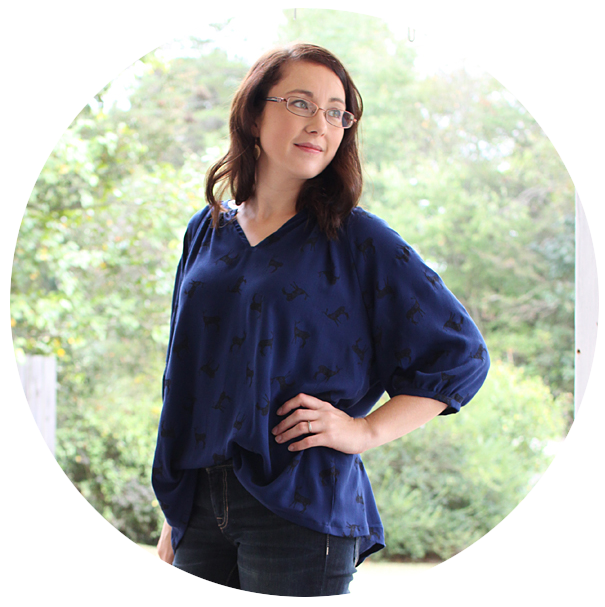 Megan is currently running a pattern of the month series, and Harper is up this month! I was excited to try this pattern, because I love the dramatic curved pockets on the front and the sleek clean lines. I was also excited to try another bottoms pattern of Megan's since I loved my Ash jeans SO MUCH and they fit so well straight from the pattern. This pattern was a relatively quick and easy sew since there is no fly to sew in, and I eliminated the lining (explained below). I was absolutely thrilled that when I pulled these on for my first fit check, that they again, fit perfectly!! I made a straight size small, which is where my measurements put me. I chose to sew View A, but with View B length. In the end, I ended up shortening by 1 inch to arrive at the length you see here. The only fit tweak I made was to take a slightly larger (1/8") seam allowance in the inseam. These shorts are definitely the "fanciest" pair of shorts I've ever made! They are intended to be fully lined, but I chose to use a pretty substantial mystery fabric from my stash, so I skipped the lining and just finished it off with the included facing. This worked wonderfully well, and still yielded a lovely end product. I chose to substitute the invisible zip in the center back for an exposed metal one. I thought it would be a fun detail, and I'm so happy with it! In the photo above you can see the cool texture of this fabric. It's almost like a double gauze, with this textured cross-hatch side, and the reverse being smooth. It's "quilted" together in a diamond pattern. I didn't do a burn test, but by feel I would say it's mostly cotton, and it's just pretty cool! I also hemmed the shorts by hand with an invisible hem stitch and it kept the look clean and sleek. Totally worth it for this pair. And since the fabric was nice and stable, it was quick for hand-hemming! When I was sewing these up, I kept playing around in my head with how I wanted to style these, and since it's basically fall, I'm craving all the comfy, cozy vibes. It's no secret I love sweaters and shorts paired together, and fall is the perfect opportunity to do so. But I felt like I needed a bit more of a "fall" element, so I scoped out my stash and found this plaid shirting. It called out to be a Willow Tank! So I listened, and I'm so happy to have this touch of plaid to add to this outfit! I love the Willow Tank, and was planning to make several this year, but hadn't yet got around to it. The first one I made (see here), I unfortunately made a size too small. Because of the sizing of the Scout Tee, I had decided to size down, but for this new plaid version, I sized up a size which is the size the chart indicated I should make. I'm happy to report the fit is perfect! Lol, listen to the size chart y'all. I did make the same fit changes to this one as previously. I did a 1/2" swayback adjustment, raised the dart 1 inch, and graded down to a size 0 at the hips. I also scooped out the neckband and armholes slightly. 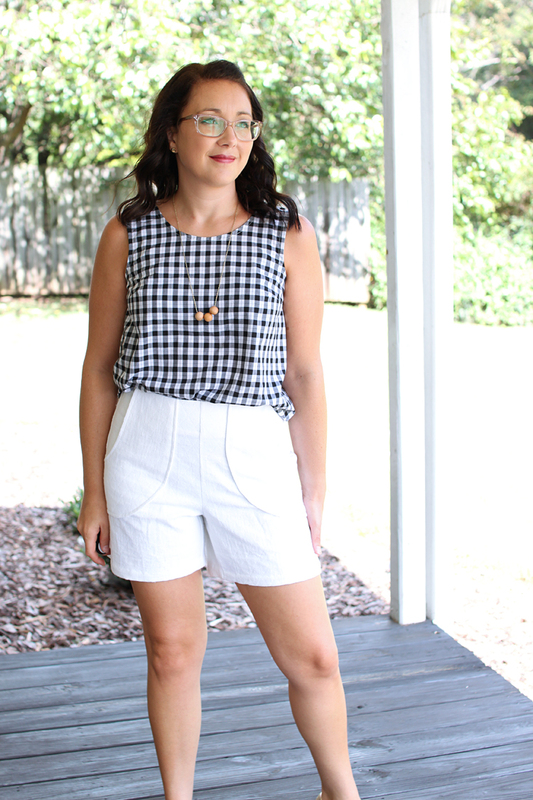 The lightness of the shirting (from Imagine Gnats), paired with shorts is perfect for our warm fall weather. 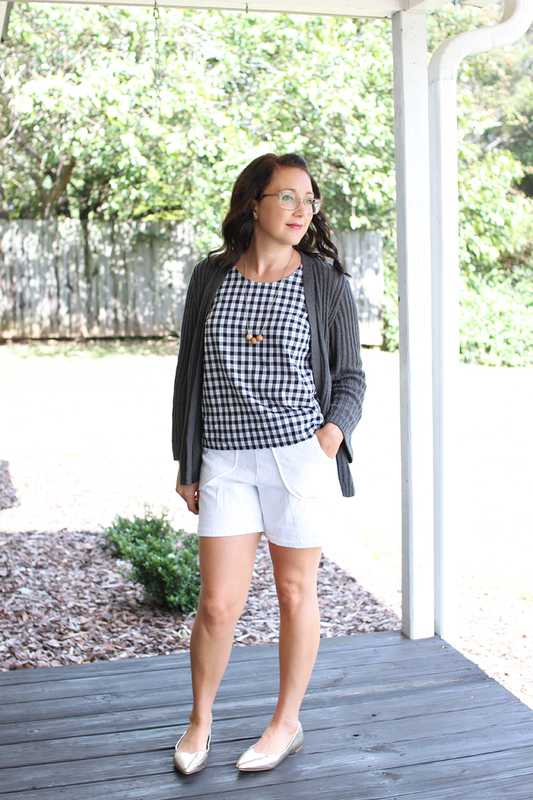 I like to wear cozy cardigans whenever possible, and I love how this one from Old Navy pairs with the outfit! 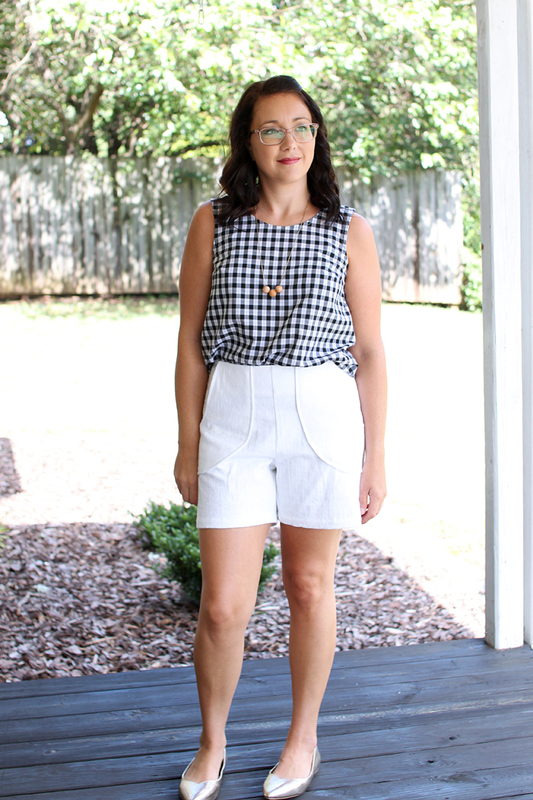 *disclosure: The Harper Shorts pattern was provided to me in return for an honest review. All opinions expressed are my own. Isn't it sewing nirvana when a pattern fits straight out of the package? Your shorts are fantastic, especially that exposed zip.